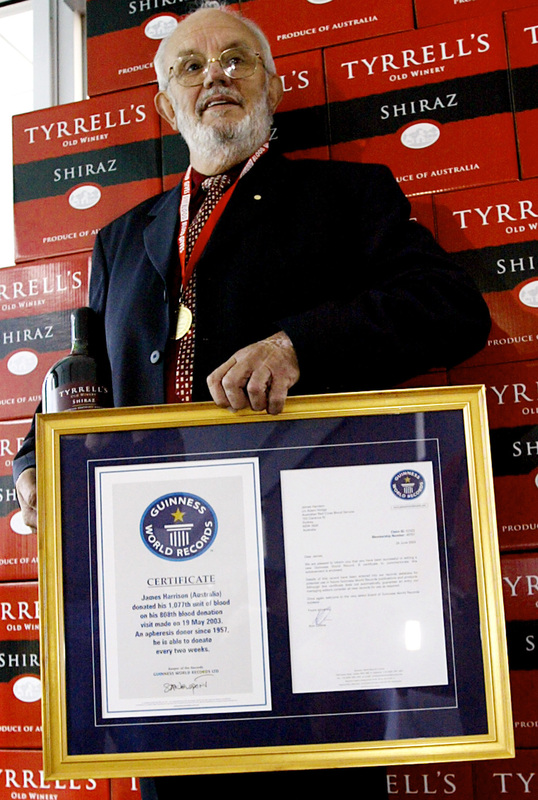 'Man With The Golden Arm' Donates Blood That Has Saved 2 Million Babies Australian James Harrison, 78, has been donating blood for the past 60 years. His plasma contains a rare antibody for a vaccine that protects pregnant women and babies with incompatible blood types. James Harrison was recognized in 2003 with the Guinness World Record for the most blood donated by one person. When James Harrison was 14, he got really sick. One of his lungs had to be removed, and he needed a lot of blood. "I was in the hospital for three months and I had 100 stitches," he recalls. After receiving 13 units — almost 2 gallons — of donated blood, Harrison knew right away that he wanted to give back. "I was always looking forward to donating, right from the operation, because I don't know how many people it took to save my life," he says. "I never met them, didn't know them." So when he turned 18, Harrison started giving blood and plasma regularly — every three weeks or so for 11 years. Meanwhile, doctors were struggling with cases of a potentially fatal condition called Rh incompatibility, also known as rhesus isoimmunization or Rh disease. It occurs when a pregnant woman has an Rh-negative blood type but the fetus she's carrying is Rh-positive. In some pregnant women, Rh disease causes their antibodies to attack the fetus's red blood cells. Scientists needed a way to turn this reaction off, and in Harrison's blood, they found it: a rare antibody known as Rh (D) immune globulin or anti-D.
Doctors believe Harrison has anti-D because of the blood he received at age 14. And so Harrison became the first anti-D donor in Australia — and the most prolific. He's in the Guinness World Records and is known at home as "the man with the golden arm." "I was prepared and wanted to give something back," he says. "And I've been donating for 60 years." At this point, he has donated enough to save an estimated 2 million babies — including his own grandson, Scott. And in 2011, when Scott turned 16, he made his first donation, sitting right next to his grandfather — who was making his 1,000th. "The whole family are blood donors. And that makes you feel proud, too," Harrison says. The Australian Red Cross knows of about 50 people who can donate plasma with anti-D, and they say that's just enough for the demand. Harrison is 78 now. At 81, he'll have to hang up the tubes and needles and retire from donation. Those are the rules. Others need to step up, he says. If you're healthy, why not? "Some people say, 'Oh, you're a hero,' " he says. "But I'm in a safe room, donating blood. They give me a cup of coffee and something to nibble on. And then I just go on my way. ... No problem, no hardship." Harrison is on vacation right now. He goes up north in his caravan and camps on a beach. But he makes sure he knows where the closest donation center is wherever he roams. "I'll be going on Tuesday, and make my 1,106th donation." That's 1,106 — and counting.